Are you looking for a way to add some extra oomph to your e-commerce but don’t know how? Would you like a strategy that doesn’t only help you sell more, but which also reinforces your brand image? That’s exactly what a pop-up store can do. Today, we’re explaining what pop-up stores are and how you can leave your competitors in the dust thanks to them. Although it’s a relatively new concept, there’s already an official definition. A pop-up store is a temporary place of business or, in other words, a short-term shop that appears and disappears after a while. As you can imagine, while it’s a trend for offline retailers, the concept actually comes from the online world and its pop-up windows that appear as you are surf the web. Just like those windows, pop-up stores appear suddenly and disappear after a short period of time, which can be anything from a few hours to a few months. Perhaps it seems like an offline concept that can’t be applied to your business? You’re dead wrong – pop-up stores can be quite attractive and profitable for your online business. You may get the urge to open one just because of how cute they can be, but it’s a decision you need to make very carefully. They may help you increase sales from your online shop, but creating them isn’t without its difficulties and there are several factors to take into account before you start making your online shop a physical reality. Let’s take a look at both the good and the not-so-good aspects of a pop-up store. The 21st-century client doesn’t just buy products – they look for experiences (experiences that they will share and value positively or negatively on their social networks). Do you remember when we talked about the importance of user experience? The same arguments are valid for physical stores and extremely decisive for pop-up stores. Adidas created one of the most well-known pop-up stores in 2016, so much so that you may have seen it without realizing that it was a pop-up store. In order to promote their classic Stand Smith model, they recreated the shoebox in different cities throughout the world. Inside the “box”, in addition to selling a limited edition model, they offered interactive experiences to clients (such as customizing their laces with 3D printers). Creating a clearly temporary space (a shoebox). Reinforcing the brand image with a highly identifiable and recognizable design. Offering additional experiences to their audience and improving the buying experience. Generating a timely increase in sales while open. As you can see, this Adidas example is one of the most comprehensive ones, but there are more advantages to opening a pop-up store. Pop-up stores are still new and yet to be overly exploited in most European countries. They are better known in the USA, Canada, and the UK, but there’s still plenty of opportunity to surprise. If you are one of the first to open a pop-up store within your sector, you will almost certainly have free diffusion in digital media and you’ll benefit from viral marketing. These types of actions are useful to link new clients to your brand in the long term. In addition, the simple act of carrying out such a new and exclusive type of marketing adds value to your brand, and that value will last beyond your pop-up store and add to your brand’s prestige. With that objective in mind, the British pre-cooked food company Birds Eye started a pop-up restaurant called The Picture House, where a new line of their food products was served. The bill was “paid” by posting a picture of the dish on Instagram with the hashtag #BirdsEyeInspirations. Taking pictures of your food for Instagram? Imagine the result. A complete participation success since this strategy was completely aligned with their target audience. Extra: Still not getting the most out of Instagram? Have a look at this post. Birds Eye, as we’ve seen, tested a new line of food with the previous example. Another way of using a pop-up store is to check which products are more profitable by asking your clients directly. That’s exactly what Bark&Co, a shop that sells accessories and toys for pets, decided to do. They opened a pop-up store in June 2016 in Manhattan and invited dogs and their owners to try their new products. The company monitored the participating dogs in order to find out with which toys they were interacting with the most so they could then improve their offer. As you can see, besides sales, it was a complete experience both for the pets and their owners. While many online shops are backed by a physical shop, there are also many businesses that only sell online. By opening a temporary physical shop, you may reach new clients and humanize your image among those who have already bought from you. Even a giant like Facebook is not beyond the power of pop-up stores. For a few days in Dublin in 2018, Facebook explained key issues related to the privacy and safety of the social network face to face with users and answered any questions that were asked. They also offer experiences for clients by letting them try out new filters in addition to experimenting with augmented reality. An easy way to “humanize” an otherwise 100% virtual company. This is a super useful option if you sell any highly seasonal products. For example, if you sell flowers and you open a pop-up shop in the city center on Valentine’s Day, you’re bound to see sales skyrocket. That’s what Amazon did on a very crowded street in Madrid to celebrate Black Friday in 2018. Though the 2,000 m2 pop-up store was open for just 6 days, it got the attention of not only the public, but also the media. And of course, it was a sales success throughout the week of Black Friday. Got viral coverage of their opening. Pop-up shops look amazing, don’t they? It’s true that they can be a really powerful strategy, but, as we all know, there’s always a downside to everything. Even though you may think you “just” have an e-commerce, surely you must have thought about the obstacles that a physical shop faces – or you may even know them if you’ve found yourself on both sides of the business. 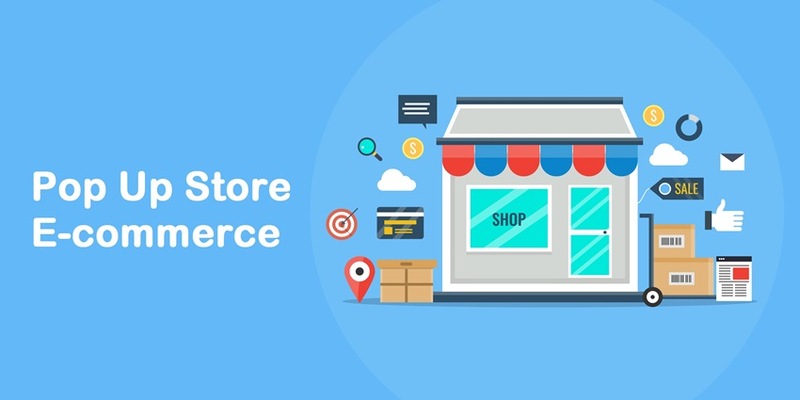 With a pop-up store, you save on the fixed cost of rent, power, etc., but you need to bear in mind that launching a physical shop based on an e-commerce, even for a short period of time, may imply some setbacks that you need to plan for. Let’s go over the most important ones. You can’t open the store in a sketchy old warehouse down a dark alley. Quite the opposite. Keep min mind that you’re trying to create a big impact with your audience in a short amount of time. The location of the pop-up store: it has to be located in an important, well-known, and accessible street with lots of passers-by and pedestrians. The space: it has to be cleverly thought out in order to surpass the ever-growing expectations of clients who are becoming more and more difficult to surprise. Any one of those could be what motivates potential clients to visit your space. To give you a rough idea, the price in Madrid for these types of spaces can range from €200 to €5,000 per day depending on the location and condition. A perfect example of how important space and location can be is the H&M pop-up store that they used to launch their beach collection in 2011 in The Hague. They took a container with their clothes to the beach! You know that despite being short-lived, every locale has its expenses that should be calculated in order to assess the profitability of your investment. License(s): depending on the city regulations where you want to set up shop. Insurance: some types are obligatory to comply with the regulations of the country where you are located (e.g., liability, fire). Security measures: to protect both the place and the products from theft. HR expenses: hiring and managing the staff if you need additional workers. Payment methods: for the sales made while the pop-up store is open. Other additional expenses: audio system, security cameras, cleaning services, etc. Luckily, there are a few options to reduce these costs. You can save on the creation of a specific stand by renting a space that’s already equipped with what you need. More and more companies are “popping up” that work specifically on the creation of temporary commercial spaces. These types of companies normally have huge databases with places that are available to rent and they help their clients create the most appropriate pop-up store for their needs (and resources). If you want to get an idea of how those companies work, you can have a look at the Go Pop-up website, a company that opens pop-up stores worldwide. Are you ready to bring your e-commerce to life? Don’t think of pop-up stores only as an opportunity to increase your sales (which is also the case). A big play like this will also boost your brand authority and visibility. Be careful, as we said before, clients want to live more experiences with brands. This type of strategy is what fosters brand loyalty.